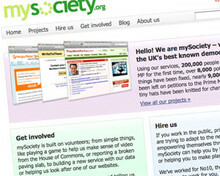 mySociety turns five - how can journalists best use its sites? Today sees the fifth birthday celebrations of one of the UK's leading democracy websites, mySociety. Since launching in 2003, mySociety, which is a charitable, non-profit making organisation, has expanded its remit to a range of civic projects involving website building and teaching internet skills. Journalism.co.uk caught up with one of its developers, Francis Irving, to find out what the site does, and how journalists can use it. So, in a nutshell, what do you do? [FI] We do the bit of democracy in between elections - we make it easier for ordinary people to watch parliament and the government, and make it run better for them. All on the internet. Five years on the online block is pretty impressive - what were your beginnings? We came from a very strong volunteer community, including programmers, mainly with jobs in web companies, who thought that the civic/social part of lives could be done much better on the internet that it was being done. The two main separate initial projects were FaxYourMP, which made it easy to send a message to your MP, and Public Whip, which helped you find out your voting record. Both were built by people in their spare time, because they wanted them. Scratching an itch that we had. We then came together to build TheyWorkForYou, and to start mySociety. And the secret to your success? Concentrate on the end user - the experience of the person using the website. Think about that, rather than about the theory, or the structure of government, or anything like that. Have people used mySociety in the ways you imagined, or brought their own mark to it? Early on somebody used WriteToThem to get their boiler moved in their council house - it had been in their living room for years. We had somebody report some dumped boxes of mozzarella on FixMyStreet. More seriously, the Information Commissioner's Office recently used WhatDoTheyKnow to see evidence about the handling of Freedom of Information (FOI) requests. It asked Rother Council to change an incorrect policy because of this. We never expected that benefit of visible information: that it would help the regulator. been more influenced by the States? On the contrary - UpMyStreet is a UK site, has been around for 10 years, and was developed by some of the people who made FaxYourMP. It was the Everyblock of its time, well before Everyblock. Likewise, when mySociety started people in the US were surprised that we were not partisan. Back then, it was normal in the US to try to use the internet for partisan (Republican/Democrat) advantage. Nowadays there are more politically neutral projects, such as GovTrack.us and the Sunlight Foundation. We've been most influenced by the open source software movement and the community of individual political campaigners that the UK has a rich vein of. How do you see yourselves expanding now? We've got lots of work to do! Everything from a TheyWorkForYou for local government, to working out ways to turn more information from all our sites into news stories. We won't be finished until all parts of our government have well made IT, designed for and from the point of view of the ordinary citizen. We're still struggling to find a business model to let us expand as much as we'd like. There are various large projects on the horizon, but they always take a while to negotiate and often fall through. Meanwhile we continue to make money from consulting and selling services, which we use to run and improve our core sites. We would encourage people to contact us if there is anything you need, or anything you'd like to pay us to add to our sites. Will you increase the amount of user-generated content in the form of video and audio on your sites? Most of our sites have very little user-generated content. We've changed that recently, but always in a focused way. We don't generally think that unconstrained user-generated content is very helpful. We do, however, think that a small amount of user-generated content that links together sites and informs people is useful. WhatDoTheyKnow is almost all user-generated content - the FOI requests that people write, and the responses written by civil servants. We just had a great success with TheyWorkForYou video getting users to collaboratively structure and link the video we had to the text. How can journalists make use of My Society's sites? Many journalists already use our sites, both nationally and locally. We have numerous email alerts on all our sites, that send you custom information about things that you are interested in. These are all great ways to have leads for stories pushed to you: subscribe to alerts for MPs in your area on TheyWorkForYou, and sign up to HearFromYourMP; do a search on TheyWorkForYou, and sign up to be emailed when new items appear with that search term (e.g. 'climate change'). It's also useful for journalists to tell readers about our sites as something that they can do after reading a story, rather than just forgetting about it. For example, if you write a story about potholes mention FixMyStreet, so people can report potholes that they hate. If you do a story about a vote in parliament, get people to look it up themselves via TheyWorkForYou. You've kept financially afloat for five years - does the current economic climate affect that? What challenges do you face? It's difficult to tell yet what the effect of the credit crunch will be on us. However, our services are not only better for the public to use, but are also cheaper and lighter than the bloated IT projects that large IT consultancies offer. So hopefully in hard times more parts of government will turn to us for help with their IT. There are lots of cost savings for government to make, by using open source software and open protocols, by having more information open, and by using iterative delivery methodologies. Now would be a good time for them to stop hiring EDS [the global service provider], and to start hiring open and small businesses such as Blue Fountain in Liverpool. What do you reckon the site(s) will look like in another five years, and will you still be here? Yes, we'll definitely still be here. At the worst end - all our projects are open source, and can be maintained fairly cheaply, so I'm confident they'll keep going at least in their current form. At the best end, we'll get enough grants and large projects to be able to do everything that we want. We'll make the European Commission comprehensible, we'll have a site that lets you find out any financial information about any part of government, and we hope to have lobbied to get some laws changed.